Vietnam: American Holocaust opens in the present day at the Veterans for Peace Arlington West Memorial to the fallen US soldiers in Iraq and Afghanistan in Santa Monica. 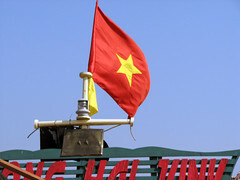 Here the strong connection between our current wars and the war in Vietnam is first made. The question of what makes a holocaust is also raised. 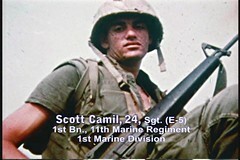 Then the scene shifts to the Vietnam Memorial Wall in Washington D.C. and while the narration continues it is revealed that the youngest US soldier to die in Vietnam was a Black Marine age 15. A clip of Vietnam era Defense Secretary Robert McNamara in Hanoi in 1995 shows him saying that 3.4 million Vietnamese were killed during the war. Further news clips from the time reveal some of the horrors of that war and show that news commentators referred to it as a holocaust at the time. 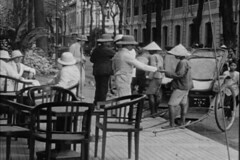 This is followed by a brief history of the 19th century French conquest of Indochina and the Vietnamese liberation struggle from 1945 through the defeat of the French in 1954. This is done with archival footage, much of it very rare, and Martin Sheen's excellent narration and the voices of the principals on both sides of the conflict. Since the focus of the documentary is the American War in Vietnam the pace slows as more details are given about this part of the history. 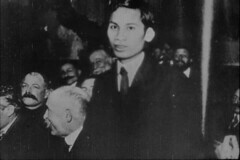 The reasons for opposing the Vietnamese independence struggle are given by President Eisenhower in a clip from one of his speeches. Then the young Ho Chi Minh is introduced, with special attention to his time in Harlem, NY and his relationship with Marcus Garvey. Again very old and rare footage is used to illustrate these years while Mr. Sheen describes the crucial events. The story of the lead up to the American war is presented with footage that also includes Roosevelt, Truman, Kennedy, Diem, Gerald Ford, Joe McCarthy, Nixon, Senator Morse, and many others. We hear Bobby Kennedy question the NSC plans for a coup in South Vietnam only weeks before President Kennedy is assassinated. 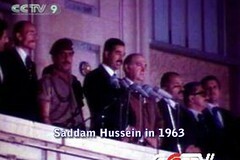 In another connection to the present conflicts, we learn of the role the Kennedy administration played in putting Saddam Hussein in power in Iraq. Since the Tonkin Gulf incident played such a big role in promoting and justifying the war, the film goes into considerable detail about it. 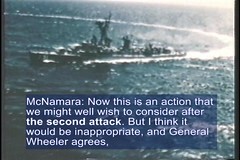 Through interviews with the captain of the US ship that was allegedly attacked, the chief gunner, a North Vietnamese general and the recollections of pilots that flew air cover on the fateful night, it shows that this attack never happened. Most significantly, using White House tapes released only a few years ago, it shows that McNamara and LBJ had foreknowledge of this phony attack that never took place. This material has never been used in a documentary before. The next segment illustrates the incredible damage done to Vietnam by the massive US air war which included bombing, napalm and agent orange. With a particularly potent instrumental from the Mama's Boys blues band that provides the sound track for the film, we hear from LBJ, Curtis LeMay, a Hanoi doctor, Vietnamese victims, and American airmen among others in a way that really brings home the brutality of the air war. The agent orange section will send chills up your spine. From there the film goes into the horrific ground war that was the real holocaust in Vietnam. This is done through the voices of American and Vietnamese soldiers and civilians that give you a real window into the tragedy of war on a human level. The Vietnam War was a My Lai every week and this point is driven home by recounting some of the many other massacres that took place. Extremely graphic images are used in this segment. You are witness to real deaths happening on the screen. You will understand why so many Vietnam vets came home with a great deal of mental anguish because of what they saw in this war. 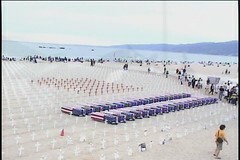 Finally we return to Arlington West in the present and the Iraq War. Again the point is made that those that forget their history are doomed to repeat it and a plea is made both by Martin Sheen and the director, Clay Claiborne, to stop this madness.